First Aid Risk Assessment. We have a new online calculator that can be used. 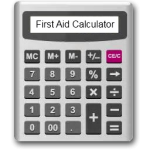 Please click the calculator icon opposite to access it (if you need assistance with your risk assessment please contact us as we would be happy to help. The aim of the qualification is to enable learners to attain the knowledge and competencies needed to deal with a range of first aid situations. We focus on the skills necessary to give effective life support, diagnose and treat injuries or illness, maintain care and comfort of the casualty. The emphasis is to deal with life threatening situations and keep the casualty alive until professional help arrives. Our instructors deliver this course in a dynamic way by relating the learning to the specific workplace, thereby making it not only relevant but interesting as well. We have all heard stories of first instructors spending the whole course talking about what they have done and their opinions! Our instructors are not full of their own self importance and will go that extra bit further to ensure all candidates gain the knowledge they require in a fun and safe training environment. Wounds & Bleeding Extras – Nose Bleeds, Amputation, Embedded Objects, Crush Injuries, Internal Bleeding. Head Injuries – Concussion, Compression and Fractured Skull. Candidates are assessed during the course on their practical skills and at the end of day one and three of the course there is a short multiple choice paper to complete. Don’t worry about these as our instructor will not assess your practical skills until you have had ample time to practice and get used to the techniques! Certificates are valid for 3 years and ScJ Training will contact the candidates prior to the expiry date to remind them of the requirement to renew in order to maintain their certification. In order to renew you must attend a 2 day First Aid at Work Re-Qualification Course. If you go over 3 months from your certificate date you will need to attend the full 3 day First Aid at Work course again. The HSE recommend that each year First Aiders attend a half day ‘Skills Refresher’ in order to stay up to date with the latest changes in procedures and to reduce the chances of ‘skills fade’. If you require a half day update course please contact us to discuss your requirements. Note – Whilst a first aider’s certificate has expired, that person will not be accepted as a workplace first aider under the Health & Safety (First Aid) Regulations 1981, so employers should encourage staff to redo their qualification in good time. The qualification is designed for people who have a specific responsibility at work, or in voluntary and community activities, to provide First Aid when dealing with a situation. Sam covered all aspects of the course in detail and answered any questions that was asked. Excellent service. Very Professional, would recommend. – T. Austin - Qualsafe Awards - Emergency First Aid at Work Course. Very approachable. Very clear + understandable. Very Friendly. – M. Braim - Qualsafe Awards - Emergency First Aid at Work Course.